Strong Canine Core! Pilates for Pooches DVD will teach your dog to move from its core while actively stretching and strengthening its muscles by using various balance training tools. Sarah Johnson, M.A., Exercise Physiologist, was one of the first to bring human Pilates to Northern California in 1990. 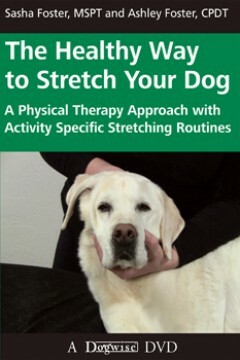 Using similar concepts, she has now designed a simple, progressive home exercise program for healthy dogs. This DVD presents a combination of lecture, outline and demonstration videos to guide you through this core strengthening and conditioning program step-by-step. It also includes a bonus section: Getting Started with a Puppy. Total Running time: 64 minutes. To assist you with the program, there are three printable PDF documents included on the disc, summarizing information from the video: conditioning guidelines, exercise outlines, and a log for monitoring your dog's progress. This DVD shows how to use balance training tools like the FitPAWS® Balance Discs, FitPAWS® Balance Pad and BOSU® Sport.